Normally my Bookshelf Roundup is a feature I do every other week, but today I wanted to slip in a special update to give a shout-out to the kind folks at Subterranean Press. A wonderful surprise came from them last week in a form of a care package containing a veritable bounty of ARCs. 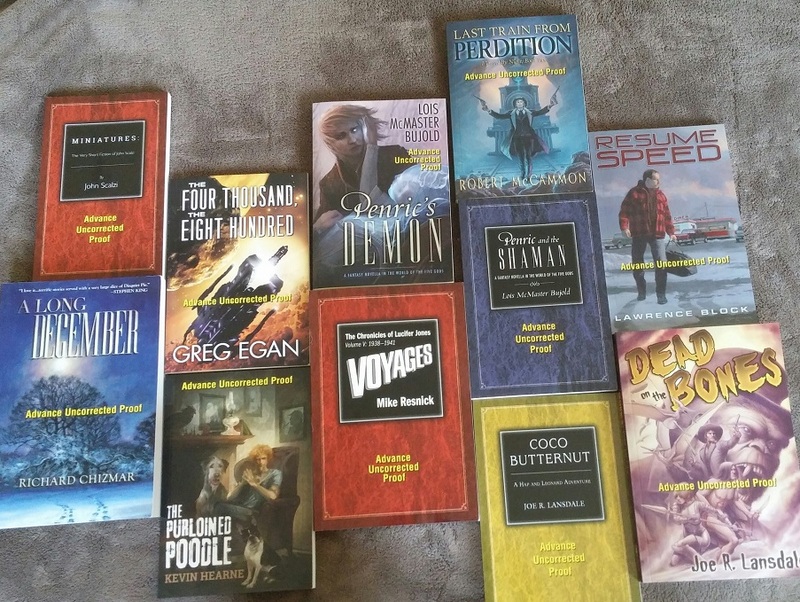 A big thank you to the awesome team at Subterranean Press for all these goodies! For more details and full descriptions of the books, be sure to check out their Goodreads pages, linked below! Almost all of these are novellas and collections of short stories, bite-sized portions perfect for some afternoon reading. The quandary is trying to decide what to pick up first. Any time I see Lois McMaster Bujold’s name though, my interest is always piqued, especially since the Penric novellas are set in the same universe as her World of the Five Gods that includes her Chalion series (which are absolutely wonderful, wonderful books). I’m also eyeing The Purloined Poodle because I’ve heard it’s adorable and funny, which shouldn’t be surprising since it’s set in the same world as Hearne’s Iron Druid Chronicles. I’ll also happily check out anything by Scalzi, even his super short stories. Most of the rest are completely new to me, but given my penchant for fantasty westerns and weird pulpy books, Last Train from Perdition and Dead on the Bones is calling out to me too! A small list since it’s only been a week, but what a week! Here are the books I reviewed since the last update, and among them are some amazing gems. Feature spot goes to The Reader, for being my favorite YA novel of the year so far. 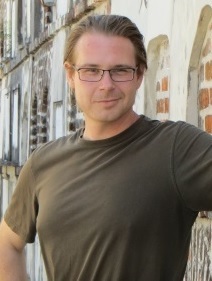 Big thanks to Seth Skorkowsky who stopped by The BiblioSanctum this week with a guest post. 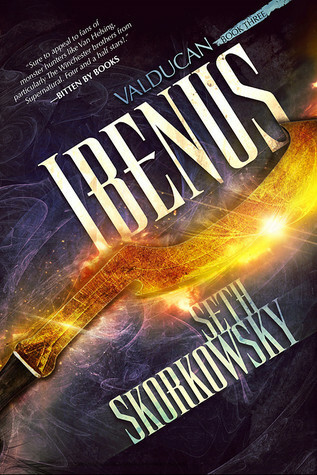 His new book Ibenus is out now, so go check it out! Young Adult, Magic, Romance, Urban Fantasy, Horror, Adventure…seems I had a taste of a bit of everything this week. Stay tuned, here’s some of what will be reviewed at the BiblioSanctum very soon. What’s even better… eating chocolate while reading. 🙂 I live in Switzerland, so we have chocolate shops and bookstores right next to each other. Wow what a lot of books. 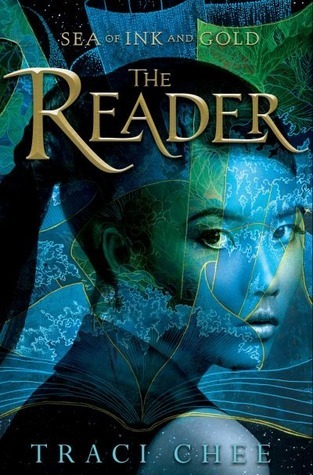 I loved your review of The Reader and really want to read that one now. You’re going to need a new house soon for all these books! My husband would be most displeased! I already have such a lot of books which is why I like the kindle these days! 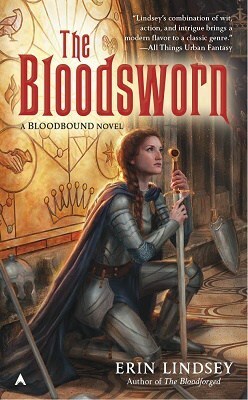 I’m just reading Bloodsworn now and enjoying it. About two thirds in. It’s one of those reads that has me worried about the ending because I just feel concerned for the outcome for some of the characters. Haha. All my book storage is long since filled and I have little stacks of books piled all over like a mad professor. I must admit that the kindle has been brilliant in stopping the rise of the leaning tower of books. Ooh very nice! I think I will need to add the Purloined Poodle to my stacks! I love Oberon! And I really need to get caught up in this series again! LOL! Happy Reading! That one looks like a super quick read so I’ll probably give that one a read myself too soon! I love Oberon as well! Very cool, I love Sub Press but didn’t realize they send books to bloggers. I might have to do a little research and make some requests! I definitely want to read the John Scalzi book. I didn’t know they did ARCs either! They contacted me and asked if they could add me to their ARC list, I said yes, and the next week a box showed up from them. Before I was only aware of Sub Press as a publisher of special prints, collector’s editions, etc. so finding out that they work with ARCs and reviewers was a very pleasant and welcome surprise! I also got a couple books for my birthday. Two of them aren’t fantasy (M.L. Stedman’s The Light Between Oceans, Ruta Sepetys’s Salt to the Sea), and one is (Victoria Schwab’s This Savage Song), but all of them are books I’m looking forward to. I’m so thrilled to hear you’re enjoying The Reader! I’ll be keeping an eye out for your review once you finish. I nabbed an eARC of Dead on the Bones last week. Looks like a great read. I agree, looks like some awesome pulpy goodness. Oooooh, I have The Purloined Poodle on preorder from Audible. I love the Iron Druid series and Luke Daniels’ narration of this series is pitch perfect, especially his Oberon. I’m very excited to listen to a novella from Oberon’s point of view. 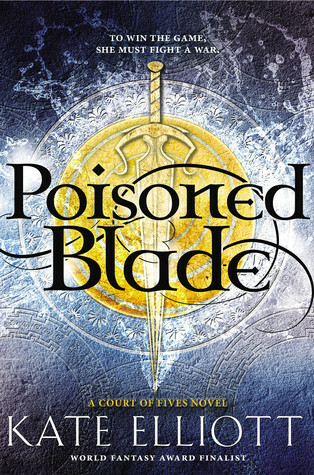 The Poisoned Blade has been hovering near the top of my TBR for a while now, but keeps getting pushed down. I hope to get to it soon. I know you weren’t so fond of Court of Fives. I hope you enjoyed the second one better. I’ve read only up to book 2 or book 3 of the series, I think. So I’m very far behind! But I’m pretty excited at the idea of hitching a ride in Oberon’s brain too, I love that cool quirky pup! 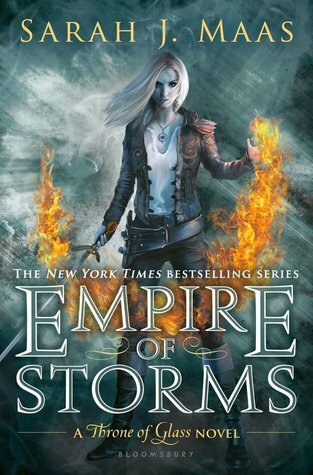 And I thought The Poisoned Blade was much better than the first book, I’m happy to say. My review should be up next week. I simply must read a Scalzi book and a Hearne book before the year is out. I read a short story set in the Iron Druid world once and with Oberon the dog, you’d think I’d have already started the series. Great haul. oh that’s nice, many books! I’m curious about the Hearne one! happy reading! I’m looking forward to the Hearne book too, he’s so funny. And thanks, you too! Great haul! I’m excited about that Scalzi anthology! Me too! Scalzi’s writing always equals fun times! I did! 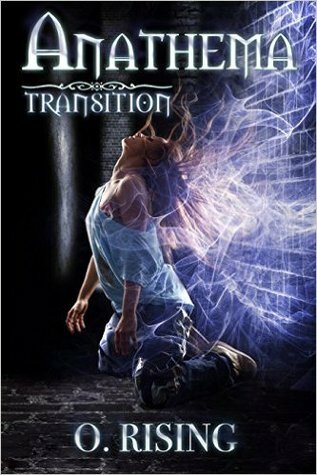 My favorite YA novel of 2016 so far! The Reader was so good, I really enjoyed it! Thanks, and happy reading to you too!